Ghirardelli Square, in conjunction with several San Francisco architectural firms, present "Celebrate The World Landmarks," an artistic Competition designed to award scholarships to local high school and college students. The Competition was created after funding for San Francisco Schools arts programs was cut in 1999. Whimsy and "out of the box" thinking encouraged! Scholarships will be awarded directly to winning students or teams to be used at their discretion. Individual students or teams may be matched with a local architectural firm for mentoring and support with the project. Teams should consist of no more than four people. Completed landmarks are due at Ghirardelli Square by Monday, March 27, 2000. 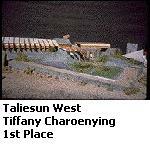 Models will be displayed at Ghirardelli Square for Judging and during an evening Award Ceremony on Wednesday, April 12, 2000. Models must be presented on a 30" X 30" base. Each entry to include at least a 100 word essay which explains the landmark's history and how it is represented via model. The explanation can be literal or creative.